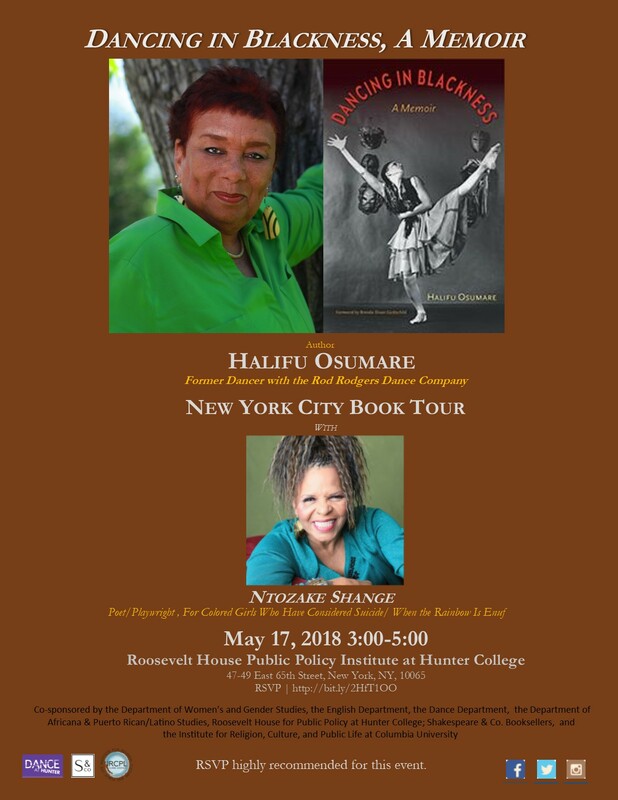 May 17, 2018 Roosevelt House Public Policy Institute Phenomenal Women Series: Halifu Osumare reading from Dancing in Blackness, A Memoir and Ntozake Shange reading from Wild Beauty, New and Selected Poems, and Osumare and Shange in Conversation!! May 17, 2018 Halifu Osumare at The JODY Center for Dance Research at Arnhold Graduate Dance Education Program Hunter College Dance Program. Funding was made available for the program for the purchase twenty-five copies of Dancing in Blackness, A Memoir for each student in the graduate dance education program to have their own personal copy!! Halifu Osumare signed each copy! May 21, 2018 at Greenlight Bookstore – Prospect Lefferts Gardens. Halifu Osumare with Jawole Zollar in conversation about their mutual journey as professional dance artist and social activist and points at which their lives intersected. Awesome close to the NYC tour Dancing in Blackness, A Memoir! Halifu Osumare’s Dancing in Blackness, A Memoir NYC Book tour came to a close on May 21, 2018 at Greenlight Books. Halifu Osumare was in conversation with Jawole Willa Jo Zollar, Founder and Chief Visionary of Urban Bush Women. Osumare and Zollar engaged in lively critical discussion about the role of dance in resistance and the transformation in social justice work. Halifu Osumare speaks with graduate students and dance educators at The JODY -the Arnhold Graduate Dance Education Program at Hunter College of the City of New York. In early March, I took on the task of organizing the NYC tour and launch of Professor Halifu Osumare’s newest book, Dancing in Blackness, A Memoir. It is now two week to the opening event on May 17th, 2018 from 3:00 – 5:00 at the Roosevelt House Public Policy Institute at Hunter , where Halifu Osumare will be join by her lifelong friend Ntozake Shange. The authors will read from their newest publications, Shange released Wild Beauty: New and Selected Poem in late 2017, and enter into conversation about the intersections of their lives and careers, highlighting ways in which dance nurture and fortify them as artist, activists, and educators. Come join Osumare and Shange on this first stop of Dancing in Blackness, A Memoir book tour! Reservations are highly recommended. Click HERE to make your reservation. in which Jaffe “expansively extends his exploration of ontological Blacknuss* as a generative and pluripontantial phenomenon—one capable of addressing the social stresses weight, fissures and breaks of being Black—and concomitantly, Black Being and Thingification—in the world” Greg Tate, 2017. Reward yourself... Make it to one of more stops on Dancing in Blackness, A Memoir NYC Book Tour!! You will get sustainable fuel for living a dance inspired life, and tools to build the better world many persons of goodwill truly seek.